This photograph shows a U.S. 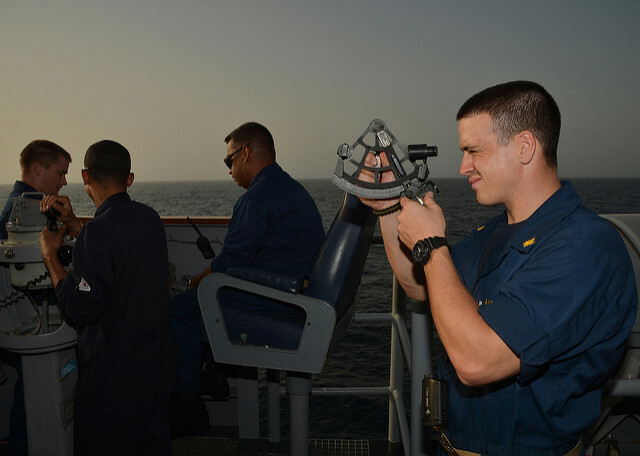 Naval Officer, at sea, practicing Celestial Navigation with a sextant. Like many civilians, the U.S. Navy finds GPS (Global Positioning System) an easy and convenient way to determine the location of their ships at sea. However, classes in the age-old science of Celestial Navigation have returned to the U.S. Naval Academy in Annapolis, Maryland, as a back-up method in case of some technological failure in the GPS equipment. Training in Celestial Navigation was standard for all midshipmen ever since the U.S. Naval Academy opened on 1845 October 10. However, the use of GPS equipment became so easy and extremely precise that the Navy ROTC ended Celestial Navigation training in 2000 and the Naval Academy stopped teaching Celestial Navigation in 2006. While the Pentagon's Defense Advanced Research Projects Agency (DARPA) helped develop GPS technology for the military in February of 1978, the U.S. Department of Defense and the Navy are now recognizing several technological vulnerabilities of GPS. In time of war or national emergency, enemies of the United States could attack and disable GPS satellites by missile or an electronics-disabling EMP (Electromagnetic Pulse) attack. Space debris could also knock-out a GPS satellite. Additionally, commercial GPS jammers can now be purchased on the Internet. A major solar flare could have the same effect as an EMP attack and knock-out the circuitry on GPS satellites. Such major solar activity has affected electronics in the past, including solar storms in 1921 and 1960 which disrupted radio communication. A major solar flare in March of 1989 knocked-out the power-grid in a large part of Quebec Province in Canada. And, a huge solar flare known as a CME (Coronal Mass Ejection) in September of 1859 (known as the Carrington Event) caused major disruptions of telegraph systems around the world (even causing small fires in some telegraph offices). Further, NASA observed a similarly-sized CME in July of 2012, but the trajectory of this particular solar flare missed the Earth. Classes in Celestial Navigation returned to the Naval Academy in the Summer of 2015. The graduating class of 2017 will be first in more than a decade to be trained in Celestial Navigation theory. Since the beginning of recorded history, or perhaps even before, mankind has used the stars to help find their way. Many of the stars have Arabic names, because people crossing deserts used stars as direction-finders. Homer's Odyssey is the first written record of the use of navigating by the stars. Calypso told Odysseus, as he sailed on the ocean eastward from her island Ogygia, to keep the bear (Constellation Ursa Major) on his left side, while observing the positions of the Pleiades (star cluster), the late-setting Bootes the Herdsman (constellation) and Orion the Hunter (constellation). Sextant – invented in 1731, an astronomical instrument which determines latitude and longitude by measuring angular distances, particularly the altitudes of celestial objects. Nautical Almanac – first one published in 1766, provides tables and charts providing astronomical data to assist with Celestial Navigation. Chronometer – invented in 1761, timepiece with a special mechanism for ensuring and adjusting its accuracy, for use in determining longitude. To obtain the latitude of a ship, a sextant would be used to measure the angular distance between a celestial object and the horizon, at a specific time. This information can be used to “fix” the latitude on a nautical chart. While sailors mostly use the Sun for latitude readings, the Moon, a planet, or one of 57 navigational stars are also used. The most popular “Guide Star” is Polaris, also known as the North Star in current times (over thousands of years, other stars have been, and will be again, known as the North Star). Other popular Guide Stars include Arcturus, Antares, Canopus (2nd brightest star in the night sky), and Sirius (brightest star in the night sky). To determine the longitude before invention of the marine chronometer, sailors would use the sextant to measure the angular distance between the Moon and planets or bright stars (called the “lunar distance”). Then, with the use of a nautical almanac, they could calculate the Greenwich Mean Time (today, known as Coordinated Universal Time or UTC). By comparing the calculated time to the local time measured on-board the ship, they can derive the longitude of the ship. A nautical almanac for mariners has been published each year, for the last 250 years. The British Nautical Almanac and Astronomical Ephemeris started publication in 1766. Starting with the calculations for the year 1855, the United States began publishing The American Ephemeris and Nautical Almanac. Over the years, these annual almanacs have had name changes. In 1981, the American and British publications merged to become the annual Astronomical Almanac. In 1940, Columbia University Astronomer Wallace J. Eckert became Director of the U.S. Naval Observatory, and the Pittsburgh native immediately took charge of producing the annual The American Ephemeris and Nautical Almanac. As war had already broken-out in Europe, the Navy had a greater demand for navigation tables. This prompted Dr. Eckert to automate the process using punched cards in a mechanical computer to generate the needed astronomical calculations, a system he had pioneered at Columbia University with the assistance of IBM. Previously, all of these calculations had been done by-hand. However, marine navigation was no longer the only challenge he had to deal with. Air power was very important during World War II. So, Dr. Eckert found the need to create a separate Air Almanac, as the usual techniques for marine Celestial Navigation required too much time for aircraft navigators. The Air Almanac was published three times a year beginning in 1941, with 730 pages of tables and charts showing the positions of the Sun, Moon, planets, and other objects at 10-minute intervals for every day of the year (today, it is available for free via .pdf file download, or can be purchased on a CD-ROM). This additional information, which had to be accurate, was critical, as even a small error could send an aircraft far in the wrong direction. And, the mechanical computers helped to provide the additional accuracy that was required. Later, after America entered World War II, a colleague of Dr. Eckert, Columbia University Professor Dana P. Mitchell, who worked on the Manhattan Project at Los Alamos National Laboratory, suggested that Dr. Eckert's IBM mechanical computers could be used for physics research. Nicholas Metropolis and Richard Feynman set-up a punch-card system, which helped develop the first atomic bombs. 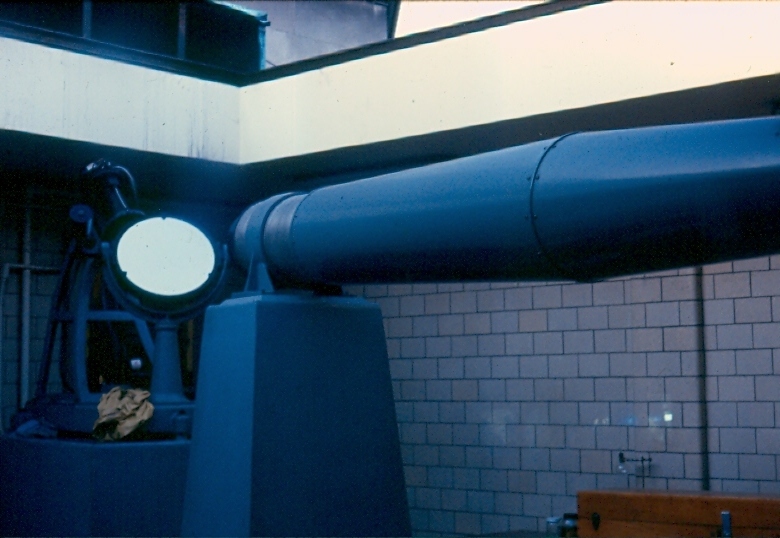 During World War II several planetaria, including Pittsburgh's original Buhl Planetarium and Institute of Popular Science, taught Celestial Navigation classes to military servicemen bound for service in the War. In fact, Buhl Planetarium premiered a public planetarium program on Celestial Navigation, titled “Bombers By Starlight,” just two and one-half weeks before the surprise Japanese attack on Pearl Harbor, Hawaii on 1941 December 7 – 75 years ago, today. Dr. Eckert continued helping guide aircraft pilots long after the end of World War II. In fact, NASA used his calculations of the Moon's orbit to guide Apollo astronauts to the Moon in the 1960s and 1970s. However, the Apollo astronauts were also trained in Celestial Navigation for their missions to the Moon, in case a loss of communication with Mission Control in Houston meant they had to navigate their way home on their own. Special Note: This article was reprinted in the 2017 March issue (Volume 46, Number 1, Pages 56 to 58, of the .pdf file) of the Quarterly Journal of the International Planetarium Society, Planetarian. Cain, Fraser. "What Was The Carrington Event?" "Astronomical Calendar: 2016 December." 2016 Dec. 1. "Largest Sunspot in 24 Years Returns for 2nd Month." 2014 Nov. 23. 75th Anniversary of America's 5th Major Planetarium." 2014 Oct. 24. "Laser Weapon Funding from Science Fiction Book?" 2013 Jan. 27. Book: "Einstein for Anyone: A Quick Read"